Outside of beautiful Peggy’s Cove is Acadian Maple Products, a family business that began from a hobby started back in the spring of 1982. Brian and Simmone Allaway wished to try their hand at making maple syrup. The experience could offer an educational experience for their children William and Cara plus a chance for them to relive a childhood experience of their own. The first try began when Brian tapped a dozen backyard trees and boiled the sap in a flat bottom pan over an open fire and together they collected the syrup and cooked it down making enough pure maple to satisfy the family needs. Over the years they had a bit of extra and sold it to the local store that sold out within a week. The store owner wanted more and soon Acadian Maple Products was born. It was great fun to watch Brian explain the process this took when William wanted to go from hobby to a business. Now the entire family is involved and Acadian Maple Products is the largest processer and supplier of Nova Scotia syrup. “We export to markets worldwide. We just finished bottling a container to go to Ireland and Scotland,” Brian Allaway explained to the group of travel writers brought to the province by the Nova Scotia tourism board. I had to take home some Apple Butter with maple syrup as a gift to the hubby, and he loves it on whole wheat toast. 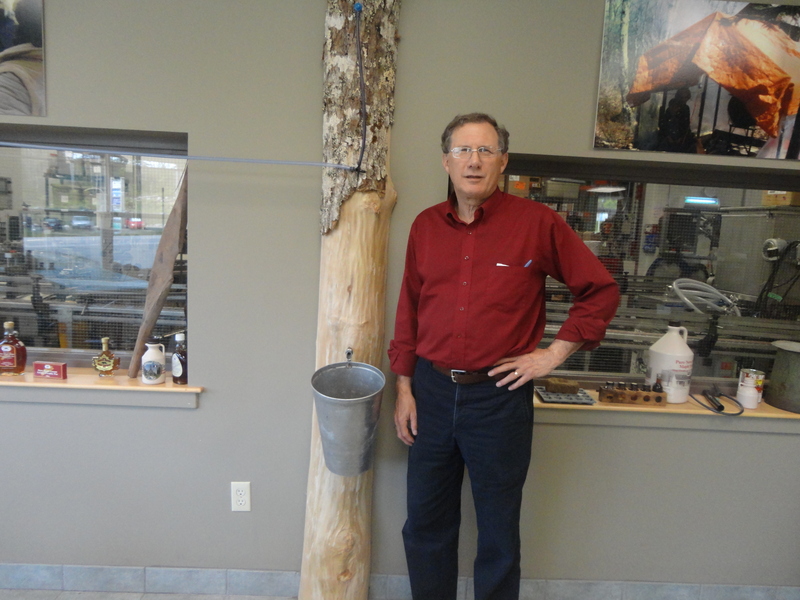 Syrup is not the only product they offer at Acadian Maple Products. Today, Acadian Maple Products makes a full range of maple, blueberry and cranberry items. With expanding taste for gourmet foods, they now such things as maple syrup, maple butter (spread), maple cream (fudge), maple candy (soft and hard), maple BBQ sauce, a line of maple and fruit jams, bulk maple sugar, maple roasted peanuts, brittle, gourmet maple coffee, blueberry syrup, blueberry maple sauce, blueberry vinegar (used as a salad dressing) cranberry mince, chutneys and marmalades. Watch for an upcoming article in Farm World that goes in depth on the family business! To learn more about Acadian Maple, log onto http://www.acadianmaple.com.